Scotty Tris: Race Announcement: GOOFY CHALLENGE! 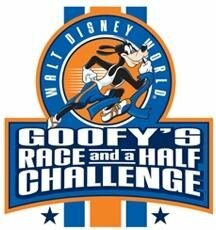 For those who aren't in the know or willing to Google it, the Goofy Challenge is a two day event in Walt Disney World. On Saturday, you complete a half marathon and follow that with a "recovery run" of a FULL marathon. 39.3 miles in two days. This race announcement is actually TWO race announcements. In addition, I'm going to run the 5k on Friday with TKB. You always need a warm-up run, right? I think this is unofficially called the "Dopey Challenge", so 42.4 miles in three days. Let's do it! This is going to be a great event because this "vacation" is being planned with Jill and my brother/sister-in-law Jake and Rebecca. Rebecca ran the Las Vegas Half-Marathon back in December when I did the full. Rebecca will be running the half and Jill will be running the full! It is Jill's FIRST marathon. I'm waiting for a couple more people to get registered for this (*cough* Joe VI *cough*). This is going to be great! While I'm not looking past my marathon goals this year, I'm already planning 2013. I'm hoping for a big 2013 and it is going to require a lot of advanced planning as registrations are going to sell out quickly for some of the events.